We’re on the front of a book! 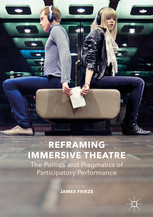 We’re on the front of a book – Reframing Immersive Theatre: The Politics and Pragmatics of Participatory Performance, Edited by James Frieze. The book is made up of a diverse collection of essays and testimonies about the twenty-first-century boom in immersive theatre and performance. We contributed to the chapter “Reflections on Immersion and Interaction” back in 2013… I wonder how our thinking has evolved between then and now?